Having just returned from a couple of months in Nepal, I have at last got around to creating myself a blog to run alongside my photographic website which is just about completed and will be up and running in the near future. Usually after such a trip, I send an email to family and friends to update them on the latest trip, but this time in Nepal I noticed that everybody had their blog which they updated as they went along. It was amazing visiting Nepal again (my 7th visit since the first in 1973) and noticing the prevalence of internet cafes even, in some instances, in remote mountain villages. How things have changed! I arrived in Kathmandu at the end of July and met up with daughter Pippa (now 22) and her friend Mandi who had arrived from Bali and Malaysia a week before. For them this is the 3 month part of a 6 month trip … they are going on to India for a couple of months before they return to Melbourne. Two days later we were standing at the bus stop waiting to board a local bus which (a grueling 12 hours later) would drop us in Shyabru, the starting point for our trek to Langtang, Kyangin Gompa, Gosenkund and Helambu, hopefully taking a month in the process. The bus was crowded, with plenty of people on the roof, and although we had seats allocated, I swapped my window seat with the Tibetan sitting next to me to relieve my sensation of being jammed in and unable to move. The road got steadily worse as the hours went past. With the monsoon in full swing the roads were mostly a sea of mud, if not an actual river, and progress was painstakingly slow. The driver was so patient and careful … admirable under the circumstances! We had to remind ourselves that this was normal for the locals and indeed, it was saving them several days walk. And so we started. 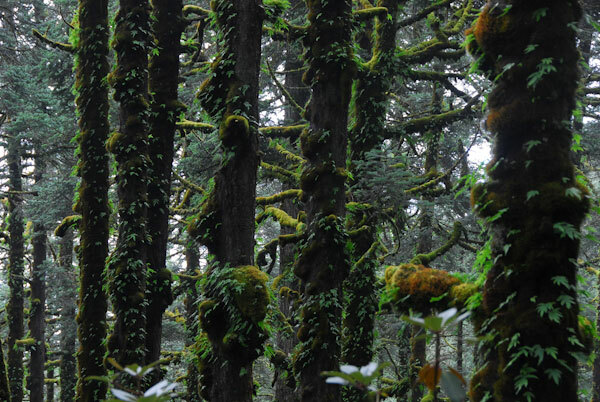 After a comfortable night in the Green Guest house, we moved up into the steep sided Langtang Kola valley and walked into wonderland. 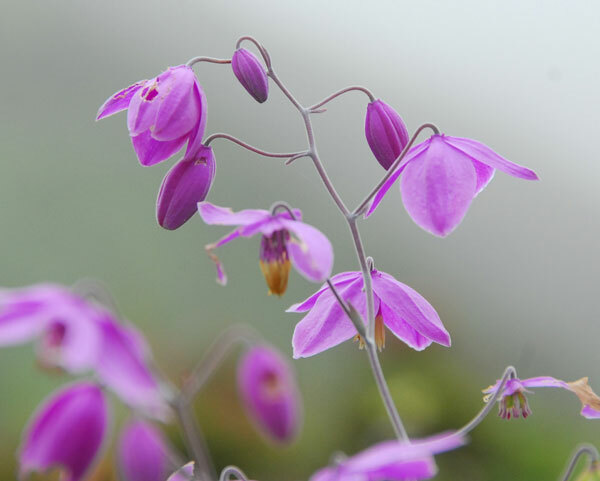 So much abundance – everything growing with the heat of summer and bountiful water provided by the monsoon rains. Our first stop was at the Landslide Lodge which perched high above the river. 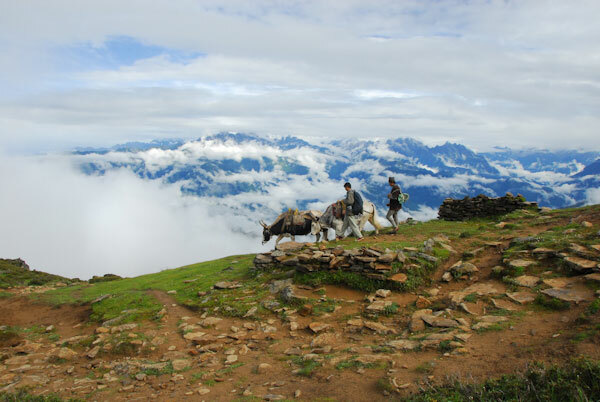 We had always intended to walk slowly – or rather to not try and keep up the pace that the Lonely Planet Guide (Trekking in the Nepal Himalaya) suggested, but the monsoon imposed its own rhythm. The mornings were usually dry, and sometimes even sunny, but the clouds came up the valley in the afternoon and it often rained. This left us snuggled into a “sun room” with a pot bellied stove, reading, playing cards and generally whiling the time away, waiting for the evening meal. This is a typical kitchen in this part of the world. Such good food! And so the days unfolded. We stayed at Ganesh Hotel in Upper Rimche (2,500m) the next night, which was a really wonderful place run by a friendly tibetan couple and with a vibrant veggie garden and excellent food. The next day bought us our first trouble of the trek. We stopped for lunch at Ghoratabela and should have stopped there for the afternoon as the clouds had started to come in. We didn’t much like the feel of the lodge and so seeing several other lodges just up the trail (according to the map), we continued into the rain, hoisting our trusty umbrellas (essential items when trekking in the monsoon). The walking wasn’t too bad, since we had moved out of the gorge and into the alpine section of the trail, but it was cold and raining and, to our dismay, all the lodges were closed, it being very much the off season. 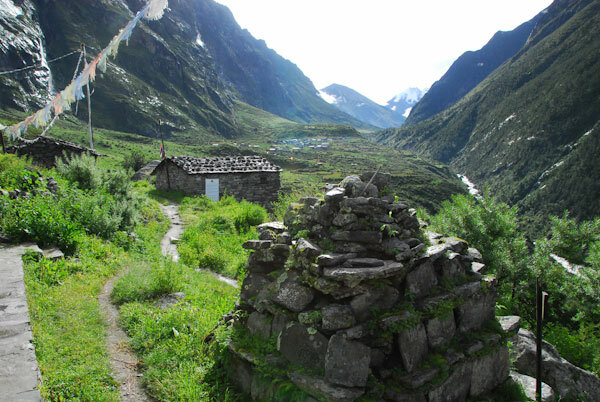 Then, just before Langtang, out of the mist emerged the tiny Hotel Tibetan, which had a single room with three beds and an adjoining dining room. We got the distinct impression we were taking the host family’s beds, an impression which proved to be correct with the family sleeping in the dining room that night. 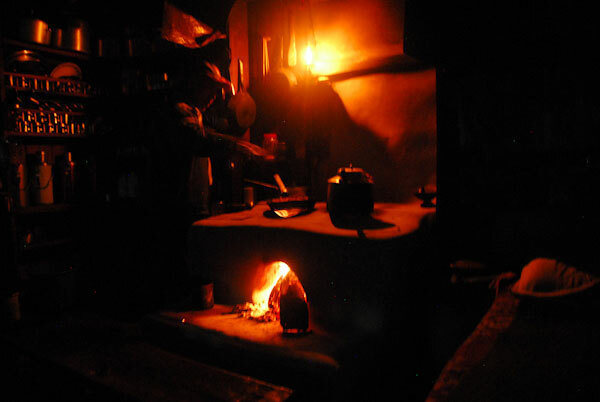 By this time we were tired and extremely cold and the glowing pot belly stove was soooo welcome. 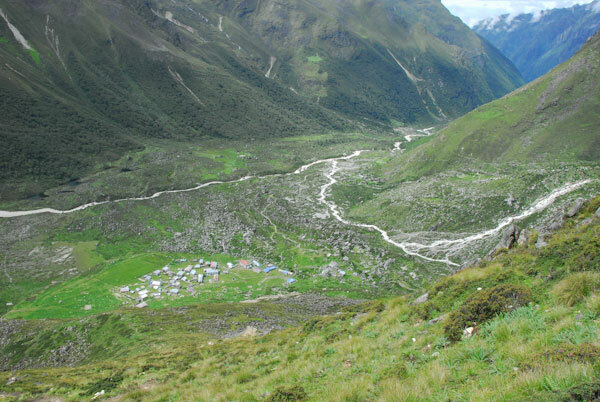 A view up the Langtang Kola valley towards Langtang Village. In the morning everything looked much brighter and we set off for Langtang to deliver the fresh green chillies entrusted to our care by the lady at the Ganesh Hotel to pass on to the owner of the Village View Hotel. This seemed a good scheme on their part to pass paying customers from one preferred lodge to another in this the very off season, and we happily went along with it. Arriving in Langtang early, after a 30 minute walk, the sun came out and we settled into the Village View for a pleasant altitude acclimatization day since we were now over 3,300 meters. The valley here is an open alpine valley with wildflowers everywhere although the peaks were still hidden by the clouds. The next morning we continued for the three hours or so it took to get up to Kyanjin Gompa at 3,700 meters where we hoped to spend a few days. We went straight to the Yak Hotel which, it turned out, was owned by the Tibetan who had swapped seats with me on the bus. 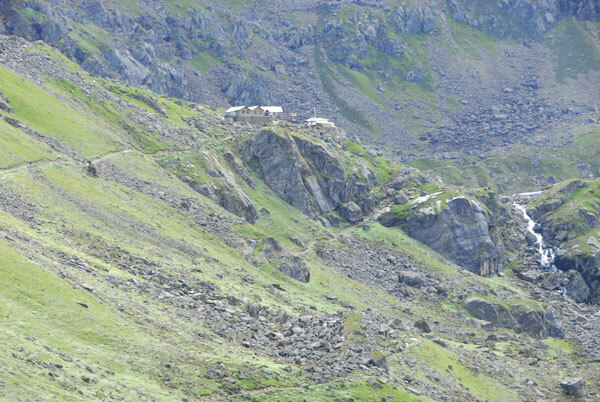 Kyanjin Gompa is very much a seasonal settlement of lodges. In the summer off season, only a few of the lodges are open and the village closes down completely in the winter. The cheese factory, however, was running at full production. There are small encampments of yak herders scattered through the high country here in the summer, and each day they make the trek down to the cheese factory with the day’s Yak milk. This factory was set up by the Swiss many years ago and produces excellent hard, swiss style cheese. I bought a kilo and shared it with Pippa and Mandi, and gave some of it to our host, Tsering Pama. 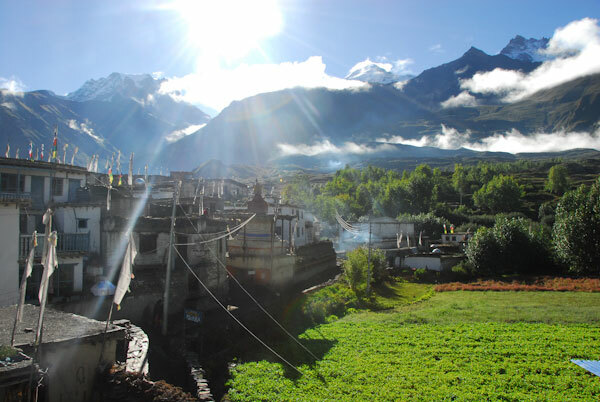 Of the four days we spent in Kyanjin Gompa, one of them dawned clear and sunny. The surrounding peaks were in full view with a fresh covering of snow. After our hot-milk-muesli breakfast, we set off towards the lookout high above the village and after a steep climb were treated to magnificent views of the mountains. This turned our to be the only clear day of the entire trek. We retraced our steps down the valley for a couple of days and once again found ourselves in the Landslide Lodge. The next day we started up the steep climb to Thulo Shyabru, a village perched high up on the side of the valley. It was a very pretty village surrounded by terraces and so we decided to spend an extra day there to rest our weary legs before tackling the climb to Sing Ghompa and beyond that we knew lay ahead. 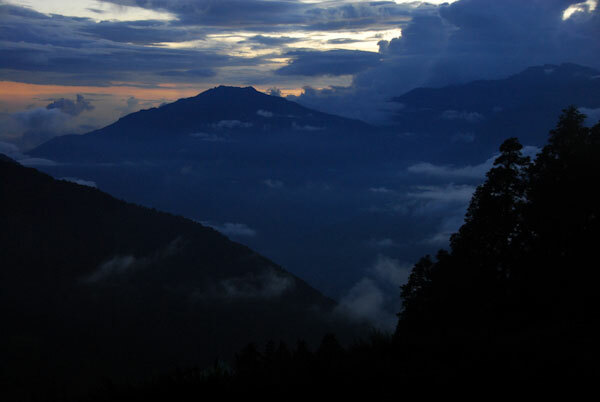 The sunset from Sing Gompa was our first of the trek. The village of Gosainkund stands on the shore of a high altitude lake at 4,300 meters. It is a holy lake and a site of pilgrimage since it is said that a lone rock in the middle of the lake is the head of Shiva. 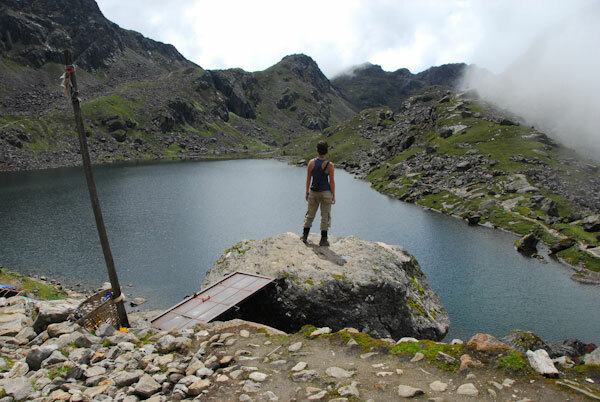 According to legend, Shiva created this lake when he pierced a glacier with his trident to obtain water to quench his thirst after consuming poison. The main season for pilgrimage is the full moon in August which was only a week after our visit. In all the villages on the route and sometimes in between, temporary structures had sprung up everywhere. Built of pole and bamboo frames with plastic sheeting for a roof, they provided the means to feed and house the expected 10,000 or more pilgrims that would make the journey up to the lake in order to bathe in it’s freezing waters. To reach Gosainkund we faced a climb of more than 2000 meters over the next three days. As we climbed through Sing Gompa and Laurebina Yak the temperature dropped and still the cloud surrounded us every afternoon. But finally, as we approached Gosainkund the sun came out and we walked (or rather puffed at that altitude) up into the high altitude valley that contains a series of lakes, one of which is the holy lake itself. Before long the clouds and rain descended once more. We had hoped to spend a few days here, but the weather, the influx of pilgrims and the associated relentless increase in prices, left us little choice but to continue out trek over the Laurebina pass (4,600 meters) the next day. Amazingly, we hadn’t bought enough Nepalese money with us. Doh! Then things got distinctly unpleasant. We climbed to the pass straight forwardly enough and then the rain started, and it hardly paused for the next three days. The trail descended very steeply from the pass and crossed numerous creeks with waterfalls descending from above, but we couldn’t really see much due to the dense cloud. We stopped at midday each day, first at Phedi (3,750m) and then Ghopte (3,450m), each with a couple of lodges, in order to give us time to dry out. On one occasion after a period of particularly heavy rain, we reached a stream we couldn’t cross because the waterfall was crashing across the trail. Pippa was all for trying to cross, but Mandi and I decided that it looked very dodgy, so we retraced our steps up to a small tea house. There, with tea in hand and feeling very wet and huddled around the small but welcome fire, we waited for the rain to stop and the flow in the waterfall to subside. Some three hours later, we managed to cross the stream. We finally made the Lodge at Tharepati (3,650m) on the Helambu trail after three of the most difficult days trekking I have ever experienced. But we had made it! It then appeared to be relatively straight forward to go on down the trail back to Kathmandu but another surprise awaited us. After a night in Gul Banyang (2150m) I set off early before Pippa and Mandi since I knew that there was a climb ahead and that I was slower on the hills. However, a road got in the way. It was an old road now not in use (indeed probably never used) but every time I got onto the trail, it seemed to throw me back onto the road, so in the end I stayed with the road. There was one point where the trail and the road parted again, but after contemplating for moment I stayed with the road. Some time later, Pippa and Mandi stood at the same point having the same contemplation when a woman from a nearly house said they needed to take the trail not the road. Oh dear … different directions! In a village, some way further on I waited for half an hour or so, but since there was no tea house (which should have made me suspicious) I carried on to the next village, some way down the hill. There I actually asked where I was and found that I had strayed and had gone an hour and a half down the hill the wrong way. I felt that I had now gone too far to retrace my steps back up the hill and virtually start the day again and my only real choice was to carry on down to Talamarang at the bottom of the valley. It was a long walk and by the time I got to Talamarang (900m) it was midday and I was very hot and tired. It took some time to recover even with the aid of milk tea and coconut biscuits! Nobody spoke any English and I don’t speak any Nepali, but I did gather that there was a bus. It came along and I paid my 140 rupees (A$2) for the 6 hour bus ride back to Kathmandu, where a taxi ride later I checked into the Dragon Lodge in Bouda, near the famous Boudanath Stupa. I was completely exhausted. Meanwhile, back in the hills, Pippa and Mandi had reached our destination and I was nowhere to be seen. Several hours and a police search later, Pippa discovered the truth and found it difficult to believe that her dear old Pa, ever reliable and dependable as he was, could ever do such a thing. I had well and truly fallen from my pedestal! 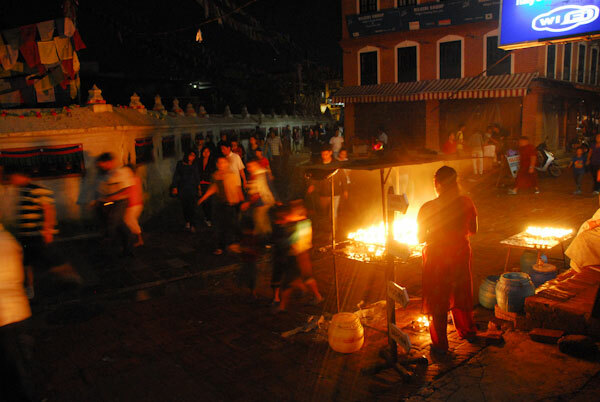 The full moon of August prompted huge celebrations at the Stupa. For the next few days one festival after another brought huge crowds of people to circumambulate the stupa and no one was put off by the almost continuous rain. The celebrations continued late into the night and started again at first light. At the end of August, Jacqui arrived (along with friends Simon and Louise and Pam and Paul from Denmark, WA) and it was lovely to see her again. We spent the first couple of days holed up in Thamel, catching up with each other and so that Jacqui could renew her acquaintance with the delights of Kathmandu … especially the shops! It only took her an hour to get lost but luckily a rickshaw driver rescued her. We then went off to the meditation retreat at the International Buddhist Academy in Boudha where we were all to spend the next 10 days with the teaching of Kenpo Jordan on the 7 point mind training for their annual international retreat. (See http://www.sakyaiba.edu.np/ for details … thoroughly recommended!) The retreat was great (apart from the fact that I got a stomach bug which took a few days to shake off) and we were all very happy about not only the teaching, but the organization and especially the food and accommodation. It was really interesting to mix with the young monks at the centre who were from all around the Tibetan sphere as well as the other participants who were from all parts of the world. Then it was time to go our separate ways. Pippa and Mandi, together with our Denmark friends, were off to walk the Annapurna circuit in western Nepal, crossing the 5,400 meter (17,000 ft +) Thorong La pass in the process. 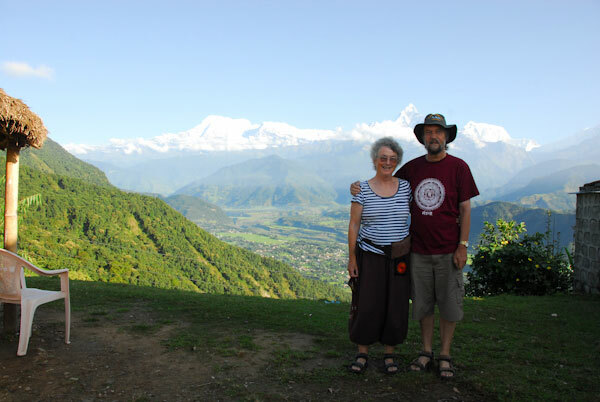 Jacqui and I were off for a less strenuous journey, first to the town of Pokhara in western Nepal and then up to lower Mustang, and to the foot of the above mentioned pass. We spend three nights in Pokhara down at the ever popular Lakeside sampling the delights of the many cafes and restaurants on offer, and enjoying walks along the shores of Phewa Lake. Then it was time to go into the mountains. Unfortunately Jacqui’s back is not up to serious walking any more. 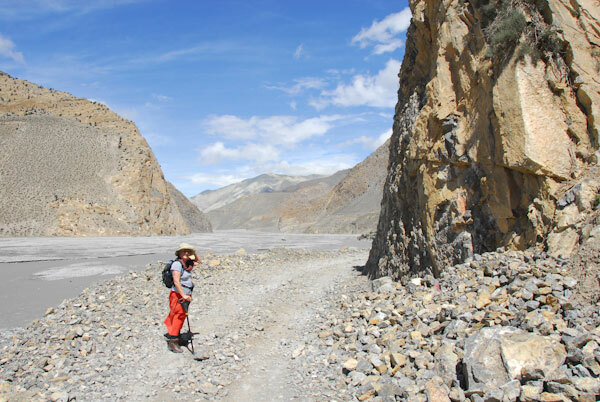 It so happens that there is a road system in lower Mustang these days. When I first heard this, I was somewhat disappointed – along the lines of “it won’t be like it used to be” but I then realised that this might mean that we could get Jacqui into the high mountains without having to walk all the way there and back. 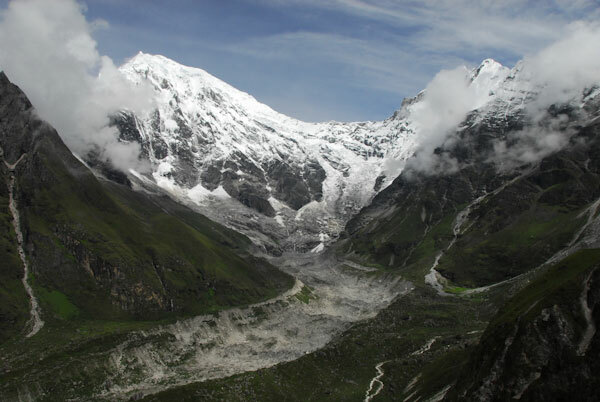 The first step was to fly to Jomsom in the Kali Gandaki gorge which is the deepest gorge in the world. 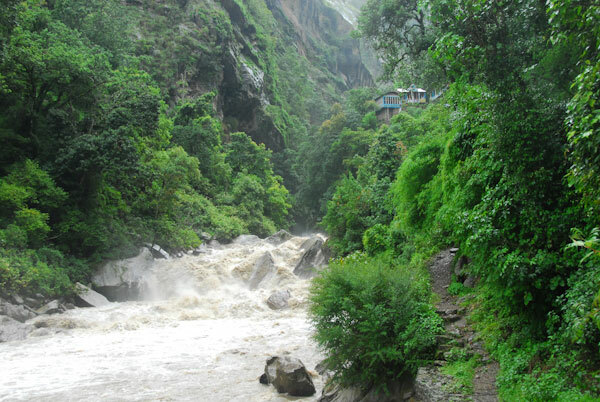 The river is at around 2,600m and sits between Dhaulagiri (worlds 4th highest mountain at 8167m) and Annapurna 1 (worlds 6th highest at 8091m). Jomsom itself is just to the north of the main valley and stands at the beginning of the rain shadow of the Annapurna Himal. So it is dry – unlike everywhere we had been so far. First thing was to find a porter. I have never used porters before but Jacqui definitely couldn’t carry a pack, so we found a local who would carry our packs (yes both of them) to our day’s destination, the small village of Kagbeni (at 2,800m) which is about 3 hours walk up the valley from Jomsom, following the spectacular gravel bar along which the braided river runs. It’s a bit like walking through a geology text book. Almost no vegetation and sheer cliffs showing the results of the folding of the mountains sliced though by an ancient glacier. We reached Kagbeni in the late afternoon, but the last hour or so proved to be very difficult for Jacqui and by the time we arrived in the Red House Lodge, she was in great pain and had stopped several times to try and relieve that pain. But she made it and I have nothing but admiration for her courage. We spent three nights in Kagbeni and the delightful Red House Lodge, so called because it is painted red to signify that it contains a small gompa dominated by a 4m high statue of the Buddha Matreya (the coming Buddha) said to be 350 years old. 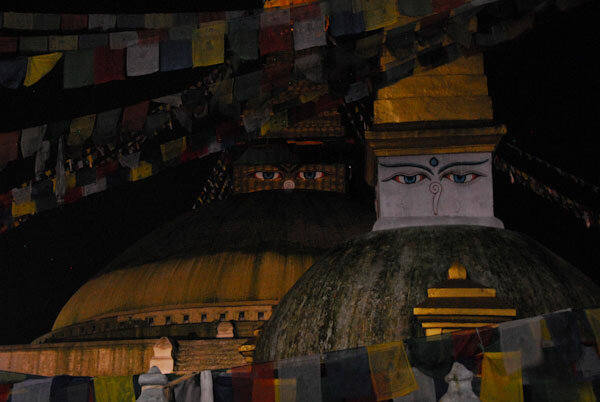 The walls of the gompa are covered with freshly painted images of other Buddhist deities. 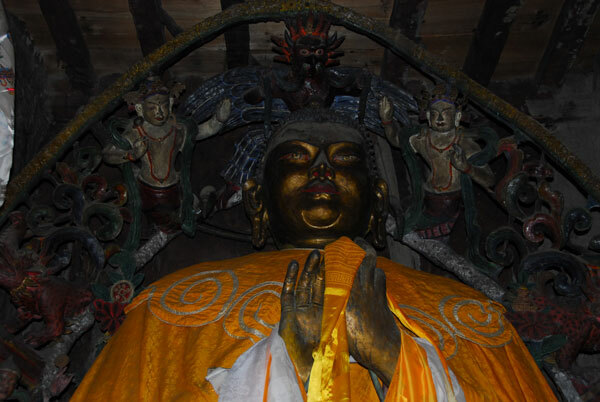 An image of a very young looking HH Dalai Lama hangs on one side, and in the centre front of the statue was a photograph of HH the 17th Kamarpa. We were surprised at this and wondered whether this young man is being groomed to take a prominent role in the Tibetan community when HH the Dalai Lama eventually passes on. 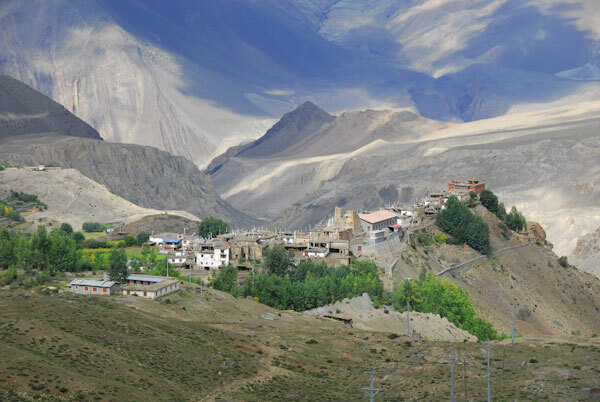 The village itself is very old with a Sakya Gompa in the shape of a huge red cube at the lower end. It would seem that all the houses are connected in some way with small alleyways and tunnels forming a honeycomb between the flat roofs of the buildings. 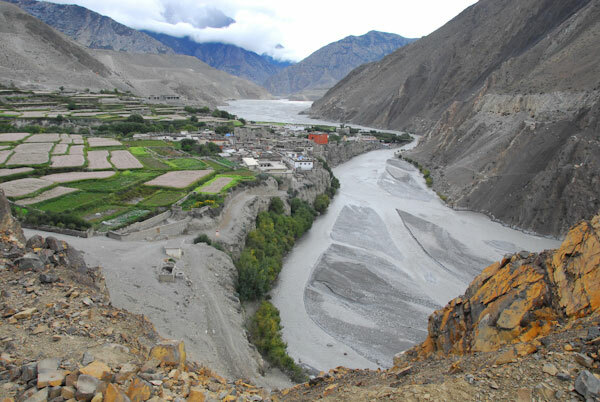 Further up the river lies Upper Mustang, the so called Forbidden Kingdom, which is still a restricted area and requires a special trekking permit to visit. Kagbeni is surrounded by terraces containing various crops, in particular buckwheat, which was due to be harvested in the weeks following our visit. Abundant vegetable patches and orchards of apples and apricots as well as the terraces, were watered by a maze of irrigation channels, centuries old. Outside the watered areas there was little or no vegetation. It’s quite amazing that such a small community has been able to survive for many hundreds of years in such a hostile environment. We hired another porter for the walk up to Jharkot, our next destination. This is a relatively easy walk of 3 or 4 hours but there is a marked change in altitude. Going from Kagbeni at 2,800m to Jharkot at 3,500m took us to the altitude where the oxygen content of the air is only 65% of that at sea level. Bring on the puffing! With the porter going on ahead with our packs, we started the climb up the steep trail outside Kagbeni which took us the first 200m of our climb. The valley opened up and our destination came into view in the distance, but still several hours away. The white walls of the temple compound at Muktinath at 3,800m, the end point of a pilgrimage that has been happening over hundreds of years, were easy to see beneath the cloud covered peaks either side of the Thorong La Pass. Most of the trail that I knew from previous visits to this area has now become the road. As luck would have it, we found out later that the Jeep drivers on this side of the valley had gone on strike for some reason that we failed completely to understand, and so we at least had no traffic to contend with. By traffic I mean the half a dozen or so jeeps per day that make up the mechanised public transport system. The old system using horses, mules and porters is still in place of course. Jacqui did pretty well for the first two thirds of the journey but by the time we stopped for a lunch of noodle soup at a small tea house, she was in a bit of trouble, and again, the last half an hour into Jharkot was slow and painful. But she made it! Such courage and determination. We made for the New Plaza Hotel where our bags had been dropped. I had told Jacqui and Pippa it was called the New Peace Hotel, a fact which Pippa will never let me forget I suspect after my mishap on the Helambu trail! We found all the good rooms were occupied, so we put up with a not-so-good room for the first night and then moved into a better room for the duration of our six night stay. The food was good, the Masala tea and the hot lemon filled in the time waiting for food to arrive in the early evenings, as did our games of rummy as the temperature dropped. Our smart “puffer jackets” came into their own. It was quite an easy time. We usually went for a walk in the mornings, when it was generally the clearest, exploring the fortress like village of Jharkot, set on a bluff in the middle of the valley and surrounded once again by terraces of crops ready to harvest. 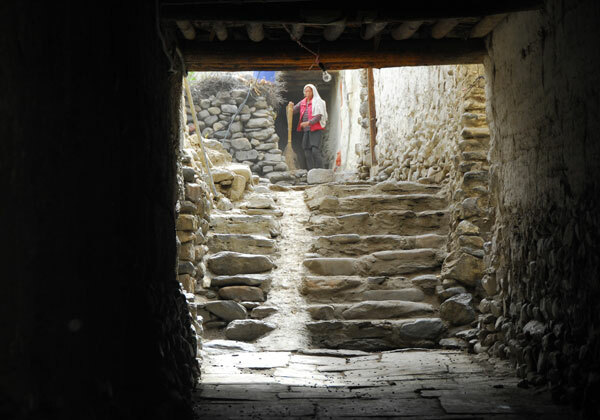 On a couple of days we walked the hour or so up to Muktinath, on one occasion going on up to the temple complex above. The weather gradually improved and on the 20th September we awoke to clear skies for the first time and rushed onto the roof to view the peaks around us. 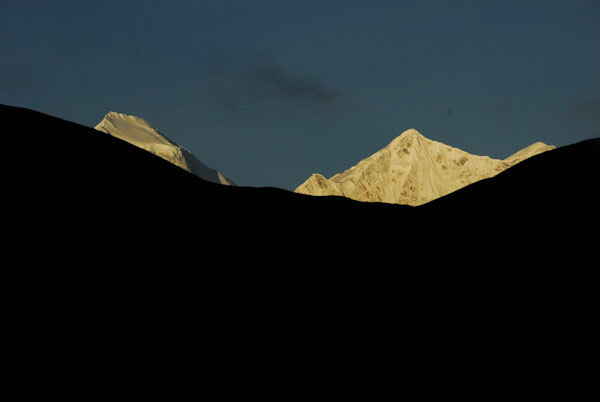 Tukuche peak and Dhaulagiri poke their heads into the sunrise. Each afternoon different people would arrive at the Lodge and most of them had come over the pass. Their experiences varied enormously from completely cloudy to heavy snow, but on this day those who crossed had a clear passage with incredibly views of the surrounding peaks and the Annapurna Himal. For the locals it meant the season was starting and they could all put their prices up (new menus appeared) in preparation for the October bonanza to come, when an average of 250 trekkers per day cross the pass. On one day a group of twenty or so trekkers turned up and we had a small experience of what it must be like at that time of the year. Dread the thought! We had hoped that Pippa would make it over the pass before we left but alas it was not to be. We found that the Jeeps were still running up and down the other side of the valley, so on our last night we moved up to the Mt Kailash Hotel in Multinath so that we could walk the 15 minutes to the Jeep stop to catch the 9am Jeep for Jomsom. Pippa and Mandi didn’t arrive, but there was some compensation. We met Ian and Gabi and their two boys, Carl and Sam, who turned out to be from Coolum, about half an hour away from us on the Sunshine coast. I am sure we will see them again. The Jeep has a sliding scale of charges – 700r’s ($A10) for westerners, 450r’s for Indian pilgrims and less for the locals. The Jeep ride was spectacular taking us down a gravel track cut into the side of the valley winding it’s way down to Kagbeni and then along the gravel bar to Jomsom. It took two hours compared to the two days it took to get there. No wonder the locals are very happy to have this extra facility, along with the mobile phone, electricity (which sometimes goes off for an hour) and television! A night in Jomsom and the flight to Pokhara saw us in the Little Tibetan Guest House at Lakeside enjoying some luxury after the mountains. Our first morning dawned clear once more, and so we took a taxi up to the lookout at Sarankot for the spectacular view of the Annapurna Himal bathed in the early morning light. Time to leave. It was back to Kathmandu for some last minute shopping and then suddenly we were on a modern Jet aeroplane winging our way towards Singapore and Brisbane, watching movies as we went, and the last couple of months became another dream to add to our collection. It’s taking us some time to get used to being back here on the Sunshine Coast but the old routines are slowly imposing themselves. The grass didn’t stop growing while we were away, mores the pity, and we once more have to think about earning money! But the trip has left us with it’s own special taste and memories of those beautiful mountains and the people that inhabit them. We will be back, I am sure. Sue told me of your blog. Sounds like a fantastic trip! So amazing, thanks for sharing the news and the photos. I was in tears reading about Kagbeni, Jharkot and the Thorong La. Pippa looks so well! Wonderful work Jacqui. That was my fourth trip to that area over 25 years, and it has lost none of it’s magic, despite the jeeps, mobile phones and the like. It is a truly spectacular place. Pippa is in really good shape just now – it will be lovely to see her when she arrives home for Christmas. You might just overlap … she will be departing on the 31st.